Collection of Reverend William Drury (1884-1970). 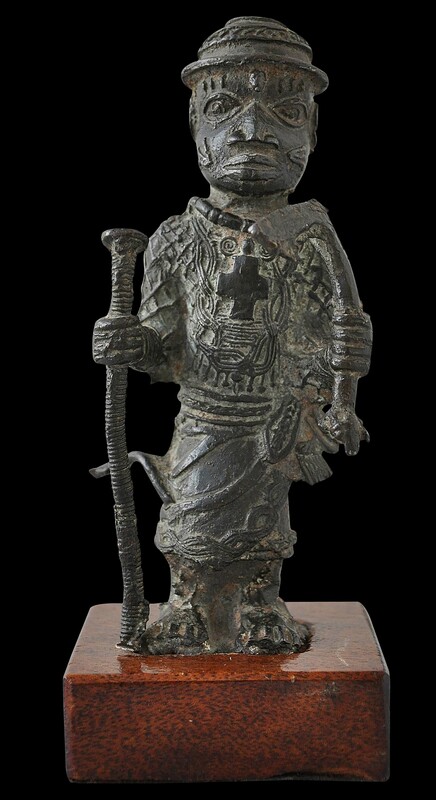 This good-sized Benin bronze has many elements that are classically from the pre-colonial Benin period, and almost certainly was associated with Benin’s royal family. Quite probably, it was taken from Benin as part of the so-called ‘Punitive Expedition’ of 1897, launched by the British against Benin’s traditional ruler. The bronze has a fine, three-dimensional quality. It also has sound provenance. The figure wears a cap-shaped, three-tiered helmet. The forehead is marked with six keloids. The almond-shaped eyes are large and have incised pupils. The cheeks feature whisker-like scarifications. The figure wears a tunic cast with a lattice design and other decoration, and a skirt tied in an elaborate knot on the left hip. On his chest, he wears suspended from a beaded necklace and in relief a cross with four equal arms. He stands holding an ‘L’-shaped metal working hammer in one hand, and a long, fine, coiled staff with a knob at the top in the other. This item was catalogued by Bonhams in 1991 as ‘circa 1600′. We do not believe that this dating is correct. The style of the figure and the style of the casting dates it to the eighteenth century in our opinion. It has a fine, dark green patina. It is solid cast and this heavy for its size. The figure has a custom-made wooden stand. It sits freely but securely in the stand. Scholars’ opinions have changed over time as to what figures such as this example were supposed to portray. The cross on the chest particularly has attracted much attention and debate. Fagg (1963, p. 32) illustrates a similar complete full figure and argues that ‘the personage may be a Christian convert of the sixteenth century, but Benin tradition says that such figures are emissaries either from the Oni of Ife of the Ata of Idah.’ Further, that the hammer held in the left hand is a type sacred to Ogun, the god of iron and war. Others have described such figures as based on messengers from Ifa, based on a fifteenth century Portuguese account which described how each newly crowned Oba was confirmed by a powerful monarch who lived beyond Benin. To demonstrate his approval, this monarch would send the Oba a new staff, a brass helmet, and a cross to be worn around the neck that was considered holy and religious although not necessarily Christian. It was thought that the messenger wore these attributes as well. The Edo people were the founders of what became the Kingdom of Benin. Their ruler styled himself as the first Oba and his city became what the Portuguese called Benin City in the 1400s. The Oba became the paramount power within the region. Oba Ewuare, who became known as the first ‘Golden Age’ Oba, is credited with turning Benin City into a fortified military centre protected by moats and walls. It was from this bastion that he launched his military expansion of the kingdom beyond the Edo- speaking heartlands. Portuguese explorers were the first European travellers to reach Benin in about 1485. A strong trading relationship evolved. The Edo traded tropical products such as ivory, pepper and palm oil with the Portuguese for European goods such as forged metal and guns. The Oba and the Portuguese king exchanged ambassadors in the sixteenth century. European visitors to Benin City in the 16th and 17th centuries brought back tales of a fabulous city of impressive public buildings, ruled over by a powerful king. English envoys were particularly impressed but the Oba soon suspected the English of having colonial designs on his kingdom. The Oba’s position was both a religious and political one. He needed the active participation of court officials in order to fulfil his ritualistic and mystical obligations. Their ability to refuse served as a means of modifying an oba’s tyrannical tendencies. The Oba was not seen as a god but his office was deemed holy. He was the living representative of his deceased ancestors and as such was deemed to have supernatural powers. Accordingly, much was done to conceal the ‘ordinariness’ of the Oba from his people: no-one outside the palace was permitted to see him eat or sleep for example. Indeed, the Oba rarely left the palace – just once or twice a year. The Kingdom’s fortunes waned after 1700 as tribal wars and changing economic circumstances took their toll but then revived in the nineteenth century as textile and palm oil exports increased. The British pressured the Oba to sign a protectorate treaty with Britain through most of the 1880s and 1890s. A treaty that placed Benin under the jurisdiction of British consular officials, permitted the presence of Christian missionaries and opened Benin to free trade was signed by the Oba in 1892, but the Oba essentially ignored the tenets of the treaty thereafter. As the colonial nature of Britain’s overtures became clearer, relations deteriorated culminating in eight representatives from Britain being murdered in Benin in early 1897. The British launched a punitive expedition – the Benin Expedition – later that year. The British force under the command of Admiral Sir Harry Rawson, razed and burned Benin City. Monuments and palaces of many nobles and chiefs were looted and destroyed, and on the third day the looted Benin king’s palace was deliberately set ablaze. The Iyoba’s palace also was raided and destroyed. Much of the city’s artwork and heritage was destroyed and what remained particularly the royal bronzes and ivories, was taken from Benin and dispersed among private collectors and museums in Europe. 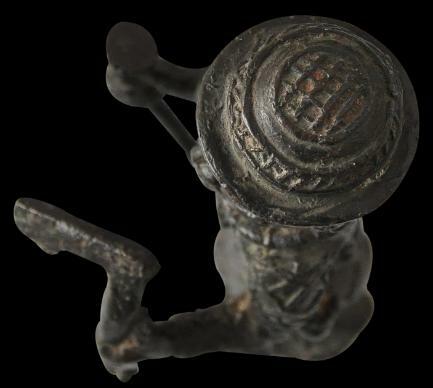 As mentioned, it is quite possible, likely even, that it was at this time that this figure was taken from Benin. 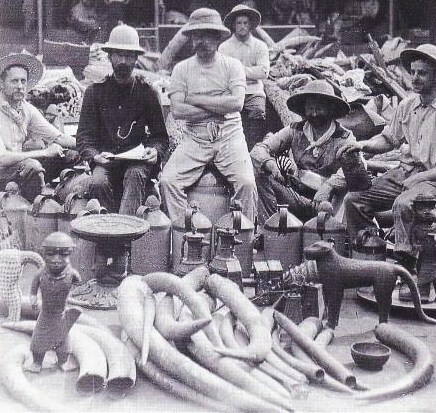 Looted items from the 1897 Benin Expedition. A larger Ewua official can be seen on the foreground to the left in the image. A version of this photograph is held by the British Museum and reproduced in Plankensteiner (2007, p. 490). Bonhams, ‘Tribal Art’, Knightsbridge, 2 December 1991, lot 45. Bonhams, ‘Tribal, Islamic and Indian Art’, Knightsbridge, 3 July 2002, lot 2. Duchateau, A., Benin: Royal Art of Africa, Presetl, 1993. Fagg, W. B., Nigerian Images, Lund Humphries, 1963. Plankensteiner, B. (ed. ), Benin Kings and Rituals: Court Arts from Nigeria, Snoeck, 2007. Fundacion ‘La Caixa’, Africa: Magia Y Poder. 2500 Anos de Arte en Nigeria, 1998.